They say you should never judge a book by its cover. 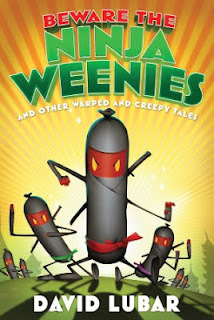 I failed to take that into account when I picked up BEWARE THE NINJA WEENIES: AND OTHER WARPED AND CREEPY TALES by David Lubar. This is the sixth book in Lubar’s “Weenies” series of short stories, and in all honesty, I've been avoiding this series, because I don't like "that kind of book." But this wasn't the book I thought it would be! I expected to find stories rife with potty humor and crass jokes, similar to the Captain Underpants series of books. Instead, I was pleasantly surprised to find a collection of clever and thought-provoking speculative fiction stories. 50 authors ... 55 books ... 3 challenge levels ... Find a new favorite book by an author near you! Announcing my Debut Picture Book: THE PRINCESS AND THE FROGS!! Princess Cassandra wants a pet frog, but she keeps kissing them goodnight. Soon, she has a castle full of princes, all proposing marriage, but Princes Aren't Pets! TWELVE STEPS is now available in paperback! Check out Talented Hubby's new Art Gallery! Proud to be a Flirt Squad member! I'm excited to mentor the best team in Pitch Wars - #TeamMagic! What's in a Name? Titles Do Matter! I'm a Mentor for Pitch Wars again this year! Add TWELVE STEPS to your Debut Author's Challenge Reading List!